Written by Summer Mengarelli. Media by Jon Friedman. Studying abroad is a daunting idea, but it just may be one of the best decisions of your life. 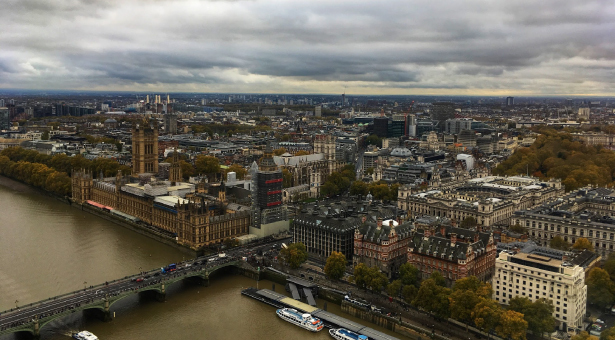 Below, GU student Summer Mengarelli documents her time studying abroad to, hopefully, entice you to do the same. Six months ago, almost to the day, I navigated the baffling terrain of O’Hare International Airport in Chicago, boarded my flight, and settled in for six uncomfortable hours over the Atlantic. We landed in Dublin at three in the morning, and from there another flight and I was shuffled through the Madrid airport with the rest of the passengers. Eventually, my program director found me and drove me to my new home in Rivas-Vaciamadrid, a suburb about twenty minutes out of the city. For the next three months, I would live in a gorgeous red-bricked, terracotta-tiled, walled house identical to every other home in the neighborhood. My host family consisted of a retired couple — two of the sweetest people I’ve met — their aging dog Moira, and a free-roaming turtle dubbed “Dory” by their three-year-old granddaughter. I took classes with a Spanish professor twice a week, but aside from those few hours I was free to do as I pleased. Almost every day I would wait at the bus stop down the street from my house, ride bus 333 to the Rivas-Urbanizaciones metro station, and take the purple line 9 into the city. Sometimes I would ride the bus in the opposite direction; the end of its route took us to Conde de Casal in the heart of the city. From there I could take a bus or metro to anywhere in the city: el Parque del Buen Retiro to people-watch by the manmade lake or check out the newest art display in the Crystal Palace; or Gran Vía to shop in the massive, four-storied Primark and other clothing stores; or Chueca for the occasional yoga class or to browse in the expensive boutique; or Malasaña, where I found one of my favorite bookstore/coffee shops; or the Royal Palace, or el Prado, or el Museo Reina Sofia, or… there is no end to Madrid’s treasures. It is a bursting city. I spent my fall semester becoming acquainted with and finding a home in Madrid; but I also visited other cities in Spain, like Segovia, Toledo, and Salamanca. 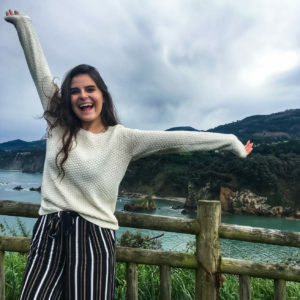 I traveled by myself for a long weekend to the region of Asturias in the north of Spain, where I watched the sun set every night over the Cantabrian Sea and relished in the greatest of the world and my insignificance. I took a weekend trip with friends to London, and in the course of forty-eight hours we saw the Queen, the Prince Consort, and Princess Kate drive away from Buckingham Palace, heard Big Ben ring on Armistice Day, attended evening prayer at Westminster Abbey, strolled through the Natural History Museum and the British Museum, and ate meat pies in an authentic pub. I spent a week in Budapest, was shown around by friends I had met by chance on the metro back in Madrid, and fell utterly and dramatically in love with the city. 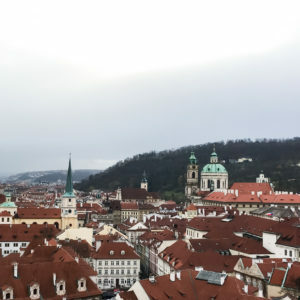 I flew from Budapest to Prague for eighteen euros and spent four days touring another city rich in history. I went back to Madrid and spent the last three weeks of the semester writing term papers in various coffee shops throughout the city, determined to make the most of what little time I had left. Living in Spain was absolutely one of the best times of my life, but I won’t hesitate to say it was one of the most challenging times, as well. My host family did not speak any English, and I was there by myself, so it took awhile for my proficiency and comfort in speaking another language to grow enough for me to get close to the family. However, now my host parents message me almost every day, keeping up with my life and asking about the friends and family they had met over FaceTime. One of the best parts of the semester was the challenge of speaking Spanish; not only did my fluency improve drastically, but it was an incredibly empowering experience to do life in a language that was not my own. If you have even an inkling of a desire to study abroad, I urge you: do it. Ask me about my semester if you want more information, and I will be delighted to talk, but be ready to listen for awhile. If you go, you will be challenged and enriched and changed; the person who boarded the plane stateside may not even resemble the person who steps off at the end of the semester. 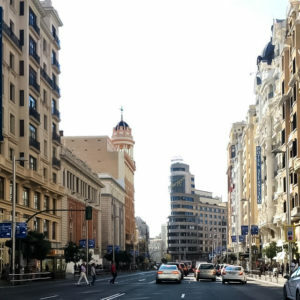 But I promise, once you’ve returned and settled back into life in the States, reunited with your friends and family and readjusted to speaking in English, there will always be a part of you that longs for the vibrancy of Spain.